Our contracts are written to insure the safety and well-being of our puppies - period. While we take every step possible to make our contract fair for all parties, we understand that there are special circumstances that crop up from time to time. Nicole L. Johnson, herein after referred to as the Seller, agrees to transfer ownership of the following puppy to __________________________, herein after referred to as the Buyer. All puppies are sold with LIMITED REGISTRATION. There are no exceptions. If the puppy is sold on a limited registration contract, the Buyer is required to have the puppy spayed/neutered by eight months of age. If puppy is allowed to breed, this contract is null and void. Buyer has three days (excluding weekends and holidays) from the receipt of the puppy to have it examined by a veterinarian and provide Seller with the results. If the puppy is found to be unhealthy, the Buyer may return the puppy for a full refund. A signed diagnosis from the veterinarian stating that the puppy is unhealthy must be provided. No cash refunds will be given after three days. When Buyer receives the puppy, the puppy will have had at least one set of vaccinations from the 3 set series. The puppy will have been checked by a veterinarian and have been wormed if necessary. Seller warrants the hips to OFA standards. Hips and elbows are warranted to be Excellent, Good, Or Fair. This warranty expires when the puppy turns 30 months old. Pet quality puppies that are unable to live a normal pet life due to discomfort from a genetic condition will be replaced with a puppy of equal value. A written diagnosis by a veterinarian must be provided before a replacement puppy will be allowed. Written proof from a Veterinarian of such defect must be presented (and may be verified by the seller's Veterinarian.) Should any such defect become evident within the first 2 years after purchase the puppy will be replaced with a comparable pup at the earliest possible time. No cash refund or other compensation for expenses will be given. This pup has been inspected by the seller's Veterinarian and is certified healthy at time of sale. If Buyer has allowed the puppy to breed, then Buyer accepts the puppy to be in good health and no guarantee will be honored. Buyer is responsible for the costs associated with shipping the replacement puppy. Puppies come with either a UKC and/or an FCI registration application or both if the puppy is registered with both registries, a copy of each parents' three generation pedigree, a copy of each parents' OFA certificate, pictures of each parent, pictures of the puppy and their shot records. 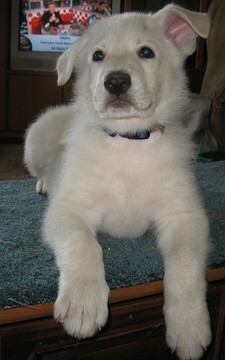 Buyer has the right to name the puppy, however, the name Gift of Grace must be at the beginning of the name. Buyer must provide the puppy an INDOOR environment. No puppies from Gift of Grace Kennels may be strictly outdoor pets. Buyer agrees to provide quality food and fresh water to the puppy daily. Buyer agrees to exercise the puppy regularly. Buyer agrees to provide routine veterinary care. Buyer agrees to take puppy to an obedience class by four to six months of age. Great dogs don't just happen. Their owners make them. Early obedience and socializing is the best way to ensure a good relationship with the puppy. Buyer agrees to provide Seller with a current address and phone number for the life of the puppy. UNDER NO CIRCUMSTANCES IS A GIFT OF GRACE KENNELS PUPPY TO GO TO A SHELTER OR RESCUE! If Buyer cannot keep the puppy, the puppy must be returned to the Seller unless a written agreement is signed by the Seller stating that the Buyer can sell the puppy to a third party. If abuse/neglect is suspected the Seller reserves the right to order the puppy to be seen by a veterinarian. If abuse/neglect is confirmed, the Buyer relinquishes all rights to the puppy and the puppy automatically becomes the property of the Seller. The Buyer will be required to sign ownership over to the Seller immediately. The Buyer will be responsible for all veterinary fees resulting from abuse/neglect of the puppy. The Buyer will also be responsible for the costs of shipping the puppy back to the Seller. Buyer understands this is a legally binding contract. Buyer has read the contract in its entirety and understands it fully. Buyer agrees to the terms within this contract.